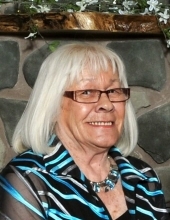 Barbara Rae (Pitman) Clayberg passed away on February 3, 2019, at Israel Hospice House. She was born on April 6, 1941, to Ray and Clara (Dahl) Pitman in Algona, Iowa. She graduated from Story City High School in 1959. Barbara married James "Stoney" Clayberg on November 28, 1959. This marriage was blessed with four children. She was a member of Immanuel Lutheran Church, where she was confirmed and married. Barb, without even realizing it, has always been the epitome of a modern-day working woman. She started working as a waitress in high school. After completing their family, Barbara worked at the local grocery store. She later helped her husband, Stoney, build their gas and auto service station business. As a grandmother ran an exclusive in-home (and sometimes station) daycare for her grandchildren, which she thoroughly enjoyed. Barb spent much of her time enjoying her family, chauffeuring her grandkids, and watching them in their various activities. She loved chatting with her friends at local businesses. Barb is survived by her children Kim (Brad) Wyatt of Story City; Kirt (Dawn) Clayberg of Ankeny; Kia Chamberlain of Phoenix, Arizona; and Karla (Jamie) Concannon of Story City; her brother, Richard (Cynde) Pitman of Chandler, Arizona; and grandchildren Gunnar (Ellen) Wyatt of Carlisle; Luke Wyatt of Story City; Tanner Clayberg of Cedar Rapids; Courtney Clayberg of Ankeny; Brody (Cassie) Concannon of Marion; Bridget, Josie and Jillian Concannon of Story City; and one great grandchild Ada Wyatt as well as many in-laws, nieces, and nephews. She was preceded in death by her husband, Stoney; her parents, Ray and Clara; and her brother, Ronnie. To send flowers or a remembrance gift to the family of Barbara Rae Clayberg, please visit our Tribute Store. "Email Address" would like to share the life celebration of Barbara Rae Clayberg. Click on the "link" to go to share a favorite memory or leave a condolence message for the family.